LONG years have rolled away, It was February 1897.I believe, when Swami Vivekananda set his foot in Bharatavarsha (India) after his triumph in the West. From the moment when in the Parliament of Religions at Chicago Swamiji proved the superiority of the Hindu dharma and left the banner of Hinduism flying victoriously in the West, I had gathered every possible information regarding him from newspapers and read them with great interest. I had left college only two or three years ago, and I had not settled down to earning. So I spent my time, now visiting my friends, now going to the office of the Indian Mirror, devouring the latest news about him and studying the reports of his lectures. Almost all that he had spoken in Ceylon and in Madras from the time he had set foot in India had thus been read by me. Besides this, I used to visit the Alambazar Math and hear from his gurubhais as well as from those of my friends who used to frequent the Math many things about Swamiji. Further, nothing escaped my notice of the comments concerning him that appeared in Bangabasi, Amritabazar, Hope, Theosophist, etc. — some satirical, some admonishing, some patronizing, each according to its own outlook and temperament. Today that Swami Vivekananda alights at the Sealdah station and comes back to Calcutta, the city of his birth. The idea I had formed of him through hearsay and reports has to be tested today and confirmed by seeing his personality. So, early at break of day many had come to welcome the Swami. I met many of my acquaintances and had many pleasant chats with them concerning him. I noticed that two leaflets printed in English were being distributed freely. These were the farewell addresses which the Americans and Englishmen had presented Swamiji on the eve of his departure from the West, expressing their feelings of gratitude for the services rendered to them by the Swami. By and by the dense crowd eager to see him began to pour in batches. The station platform became a surging mass of humanity. With anxious expectation every one was inquiring of one another. "What more delay for the Swami's arrival?" We heard then that Swamiji was coming in a special train, and that there was not much delay for his arrival. There it is! The sound of the train is being heard, and with usual puff, the train heaves into the platform. As the carriage stopped, I was fortunately placed on that very spot overlooking the carriage that brought in Swamiji. Swamiji was standing up and making his salutation with folded palms to all assembled to receive him. At that moment I only could get a cursory glance of him. The Reception Committee with Babu Narendra Nath Sen at its head approached Swamiji and brought him down from the train. Many crowded to take the dust of his feet. 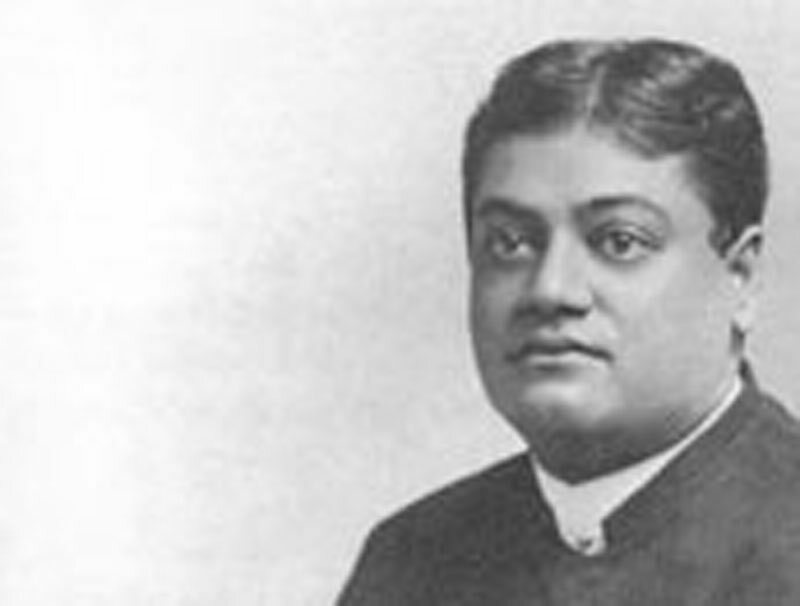 On this side of him the anxious crowd was spontaneously shouting in exultation of joy — "Jai Swami Vivekanandaji Ki Jai! Jai Ramakrishna Paramahamsa Dev Ki Jai!" My voice too mingled with it and began to ring in tune with theirs. When we came out of the platform, we found that Swamiji's carriage was already unhorsed and a band of young men were getting ready to draw it up themselves. I also tried to join them, but the crowd prevented my doing so. So giving up this attempt, I began to walk accompanying the carriage from a little distance. In the station a sankirtana party had come to receive him, and along the road a band was playing, ahead of the procession. The roads were decorated with festoons and buntings. The carriage came and drew up in front of Ripon College. This time I was able to get an opportunity to see Swamiji well. I found him with his head projected out of the carriage and talking with some old acquaintance. That face was extraordinarily brilliant, and "seemed as if it was emitting rays of brilliant light; yet it seemed lo he a bit dim because of the fatigue the journey entailed. There were two carriages. In one were Swamiji and Mr. and Mrs. Sevier. The Hon. Babu Charu Chandra Mitra was standing in this carriage and with the movements of his hand was manipulating the crowd. In the other carriage were seated Mr. Goodwin, Mr. Harrison (a European Buddhist monk from Ceylon), G.G., Kidi, and Alasinga (who were three of Swamiji's Madrasi disciples), and Swami Trigunatita. Because of the earnest entreaties of many, Swamiji got down from the carriage and addressed those present for two or three minutes, and then drove towards the house of Pashupati Babu in Baghbazar. I also tendered my salutations mentally and wended my way back to my house. After my noonday meal I went to the house of Khagen (Swami Vimalananda) and from there drove together in their cab to the house of Pashupati Babu. Swamiji was at that time resting in an upstairs room. Many people were not allowed to go in. Fortunately for us, we were able to meet with many of Swamiji's gurubhais, well known to us. Swami Shivananda took us to the presence of Swamiji and introduced us to him with the words: "These young men are your ardent admirers." Swamiji and Swami Yogananda were sitting side by side on two easy chairs in a well-furnished room in the first floor of the house. The other Swamis were moving hither and thither clad in their gerua robes. We bowed down to Swamiji and occupied the carpet on the floor. Swamiji was then speaking with Swami Yogananda. The topic of conversation was his experiences in America and in Europe. "Well Yogin, do you know what I saw in the West? All over the world I was seeing only the play of the same great shakti (Divine Energy). Our forefathers manifested that power in religion and philosophy, and the West is manifesting the selfsame energy in the modern age through dynamic activity. Truly, through the whole universe there are only different expressions of that same maha-shakti (Great Energy). Swamiji and his disciples, Mr. and Mrs. Sevier, were staying in the garden-house of the late Gopal Lal Seal in Cossipore. We had been frequenting this house for some time with our friends and relations to attend the conversations of Swamiji. I shall try to put down here what little is left of my memory of these days. It was in one of the rooms of this garden-house that I talked directly with Swamiji for the first time. Swamiji was then sitting within and I went and prostrated myself before him. There was nobody else in the room. Suddenly, I do not know why, Swamiji asked me. "Do you smoke?" I replied, "No", to which Swamiji replied, "Very well, smoking is not good. I am also trying to leave it off." Another day Swamiji was speaking with a vaishnava who had come to see him. Swamiji was saying, "Babaji,* once in America I lectured to them on Shri Krishna. Captivated by that lecture, one exquisitely beautiful young lady, the mistress of a great many attainments and heiress to an immense fortune, renounced everything and retired to a solitary island and lost herself in the intoxication of meditation on the Lord. "Afterwards Swamiji began to speak on "Renunciation". "In all religious sects that do not keep aflame the fire of renunciation, degeneration quickly sets in...."
Another day we found a large gathering sitting before him. His conversation was aimed at a young gentleman, who was staying in the quarters of the Bengal Theosophical Society. The young gentleman was saying. "I went to many a sect and denomination, but I could not yet find out Truth." Swamiji replied in endearing terms, "Well, my child, once I too was in the same disconsolate state of mind as you are. Why should you be so anxious on this score? Tell me what they advised you to do, and what you have done all along." The young man replied, "Sir, in our society there is a preacher, Bhavani Shankar by name, who is a profound Sanskrit scholar. He made me understand in a beautiful way the value of image worship in the scheme of spiritual development. Obeying him I began to worship with the proper ceremonials for a time, but this did not give me the peace I was yearning for. At that time one gentleman told me, 'Try to make your mind void, and if you can succeed in the attempt, you will get peace.' I also spent some days in following this advice, but to no purpose. Sir, even now I sit in a closed room, and meditate as long as I can. Yet, peace is far, far away from me. How am I to gain peace?" Swamiji continued to speak to him in endearing terms: "My boy, if you have any respect for my words, the first thing I will advise you to do is to throw open all the doors and windows of your room! In your quarter there are lots of poor people sunk in degradation and misery. You will have to go to them and serve them with all your zeal and enthusiasm. Arrange to distribute medicines to those who are sick, and nurse them with all care, supply food to him who is starving, teach with as much as lies in you the ignorant; and if you begin to serve your brethren in this wise, I tell you, my child, you will surely get peace and consolation." The youth: "Sir, weak as I am, if I alone go to serve the poor and thereby break the regularity of my life by keeping awake late at nights, I might fall ill, and then what shall become of me?" All along Swamiji was speaking with the youth very lovingly, sympathizing with all his mental troubles; but the last words of the youth very much vexed him, and so Swamiji next, talked with him in another strain: "Look here, while volunteering to do service to your brethren, you set a higher price on your own life. I can now understand well — so also those who are present here — that you are not that sort of man who would exert so much in the service of the sick as to affect your own health and convenience." There was no more talk with that youth. Another day the talk was with Master Mahashaya, the author of the Gospel of Sri Ramakrishna. Master Mahashaya was asking Swamiji: "You speak of service, charity, and doing good to the world; do not they too belong to the domain of maya? When the goal of Vedanta is mukti (liberation), to cut at the root of all maya, what will be the result of these teachings to the people who are already bound tight in the coils of maya?" Out came a curt reply from Swamiji that startled Master Mahashaya and made him speechless: "Does not the idea of mukti also lie within the realm of maya? Atman (the Self) is nitya-mukta (ever free). Hence what necessity is there for you to attempt for it?" We understood that Master Mahashaya was ready to prescribe dhyana, japa, dharana, and other devotional practices to all classes of aspirants setting aside the importance of service, charity, love and benevolence. But according to Swamiji, just as devotional practices are of vital value to a class of aspirants, so there are other classes of aspirants for whom the ideals of karma-yoga are the real incentives of spiritual development. If you belittle the importance of the latter, you have also to set aside the efficacy of the former; but when you accept one course of sadhana (the spiritual practice), necessarily you cannot help accepting the other course too. We were able to grasp from this pointed reply of Swamiji that Master Mahashaya was belittling the ideals of karma-yoga as being a part of maya and was accepting dhyana, japa, dharana, etc., as the only paths to mukti. The generous heart and subtle intellect of Swamiji at once perceived this fallacy, and he could not bear this limited and narrow interpretation of spiritual practices. He showed by his wonderful arguments that even the struggle for liberation is within the domain of maya, and by giving service, charity, etc., the same place as the devotional practices in the development of the spiritual life, he enunciated that the followers of the karma-yoga too have the same claim to recognition as the followers of the other yogas. Next the conversation was diverted to Thomas à Kempis, and his Imitation of Christ. Many of us know that before Swamiji renounced the world, he was reading this book with special interest, and when the habitation of the Sannyasins shifted to Baranagore, the gurubhais of Swamiji used to read this book and study its teachings as special aids to their sadhana. Swamiji loved this book so much that in those days he had contributed to a contemporary magazine Sahityakalpadruma, an introduction to the book which he named in Bengali as "Ishanusarana" and had freely rendered its teachings into Bengali. By reading the introduction we can understand with what an attitude of mind Swamiji looked upon this book; so much of awe and reverence he evinced towards its author! And really such innumerable and illuminating counsels the book gives on renunciation, discrimination, humility, dasya bhakti,* etc., that it cannot but evoke these sentiments in the mind of any one who reads it. One of those present there felt the curiosity to know Swamiji's opinion on the teachings of the book now. So he read out a teaching in the book about humility and remarked that without considering oneself as the lowest of the low it is impossible to get spiritual development; Hearing this Swamiji said, "What more need for us to consider ourselves low? Where is ignorance again for us? We have enjoyed the bliss of Illumination — we are children of that Illumination." From this reply we could easily understand that he had transcended the stages of preliminary sadhanas, as mentioned in that book, and had reached great heights of realization. We especially noted that even trivial everyday occurrences of life did not escape his scrutiny and he transmuted them as aids to popularize high spiritual truths. Once Shri Ramlal Chattopadhyaya, the nephew of Shri Ramakrishna, known amongst the Ramakrishna Order as Ramlal-Dada, came from Dakshineswar to visit Swamiji. Seeing him, Swamiji got one chair for him and requested him to take his seat while he himself strolled to and fro. "Dada" felt very delicate at this respect shown to him and began to implore Swamiji to take that seat; but Swamiji was not prepared to leave him; with much protestations, "Dada" was made to occupy the chair. Swamiji continued to walk up and down repeating to himself, "guruvat guruputtreshu — One should treat the descendants of the guru with the same honour as one would treat the guru." Here we noticed that though Swamiji was the recipient of such glory and honour, there was not the least trace of any conceit in him. We learnt, too, that that was the way to showing one's gurubhakti (devotion to guru). Many students had come to see him. Swamiji was then sitting in a chair. All were squatting around him eagerly waiting to hear a few words from Swamiji. There were no seats left where the boys could sit and hear him. Hence they had to sit on the floor. Perhaps it struck Swamiji that it was better to have given them seats; but perhaps soon his mind was turned on some other topic and he thought otherwise and said, "Doesn't matter! you have sat well. To practise a little tapasya (austerity) is good." One day we took with us Shri Chandi Charan Vardhan who lived in our quarter of the city. Chandi Babu, was the manager of a small Hindu Boys' School where education was given up to the third class. From the beginning he was a great lover of God. After reading the lectures of Swamiji he developed an intense faith in him. Formerly he had even thought of renouncing the world for facilitating his devotional practices; but he was not successful in this attempt. For a while he was an amateur actor, in a theatre and he even figured as a playwright. He was very emotional by temperament. He had picked up the acquaintance of Edward Carpenter, the famous democrat. In his book Adam's Peak to Elephanta, the author has given an account of his meeting with Chandi Babu as well as a picture of him. Chandi Babu came and with great reverence made his obeisance and asked Swamiji. "Swamiji, whom can we accept as guru?" Swamiji: "He who can understand and speak to you of your past and future can be recognized as your guru. My guru spoke all about my past and future." Chandi Babu: "Well, Swamiji, does wearing kaupina in any way help in controlling lust?" Swamiji: "A little help might be got thereby. But when the passion gets strong, could it be checked, my child, with a kaupina? Unless and until the mind is completely given to God, no external check can completely obliterate lust. But then, you know, as long as the mind has not reached that stage, it tries to protect itself by external aids. Once in me rose the feeling of lust. I got so disgusted with myself that I sat on a pot of burning cinders, and it took a long time for the wound to heal." Chandi Babu put Swamiji many questions regarding brahmacharya (continence) and Swamiji with utter frankness clearly expounded all its secrets to him. Chandi Babu was making severe attempts at sadhana — but being a householder he had not the facility at all times to do this to his entire satisfaction. Fully knowing that brahmacharya was the prime necessity for all sadhanas, he was not yet able to act up to it to his entire satisfaction. And as he was engaging his time in the management and education of young boys. he had occasion to notice how by the absence of any moral and religious education of young boys, and by association in bad company the boys lose their sexual purity even at a tender age; and he was always thinking within himself how to resuscitate the lost sexual purity in the boys. But how can one who himself has not attained a thing give it to others? Thus unable to gain brahmacharya with regard to himself and plant the same in his boys, he used to get much worried and desperate at times. So now hearing from that ideal brahmacharin, Swamiji, his straightforward counsels and energetic words, it struck him suddenly that this mahapurusha (great soul), if he minds, could revive in him and his boys the ancient ideal of brahmacharya. I have mentioned earlier that Chandi Babu was very emotional by temperament. Suddenly, as it flared up by an uncontrollable enthusiasm, he shouted out in English in great excitement, "Oh Great Teacher, tear up this evil of hypocrisy and teach the world the one thing needful — how to conquer lust". Swamiji pacified Chandi Babu. The topic of conversation next was Edward Carpenter. Swamiji said, "At London, he used to call on me on many occasions and sit near me. Many other Socialist Democrats also used to visit me. Finding in the religion of Vedanta a strong support for their ideals, they felt much attracted towards its teachings." Swamiji had read his book Adam's Peak to Elephanta. This brought to his mind the picture of Chandi Babu printed therein, and he told him that he had already been familiar with his appearance. The shadows of evening began to fall, and so Swamiji got up for a little rest. And addressing Chandi Babu, he said, "Chandi Babu, you come across many boys; can you give me some excellent boys?" Chandi Babu was a bit absentminded when Swamiji said this. So, unable to understand the full bearing of Swamiji's words, when Swamiji retired to his room he followed him and inquired what he had said as regards some beautiful boys. Swamiji replied: "I do not want those whose appearance looks well. I want some strongly built, energetic, serviceable boys of character, I want to train them up so that they may get themselves ready for their own liberation as well as for the good and welfare of this world." Another day we went and found Swamiji walking up and down and talking very familiarly with Shri Sharat Chandra Chakravarti (the author of Swami-Shishya-Samvada). We were very eagerly waiting to put Swamiji one question. The problem was this — what is the difference between an avatara and a mukta (liberated soul) or siddha purusha (perfected being)? We especially requested Sharat Babu to place the question before Swamiji, and he did so accordingly. But without giving a direct reply to this question, Swamiji said, "Of all states videha-mukti (freedom after death) is the best — this is my firm belief. During my sadhana period when I was travelling round Bharatavarsha (India), how many days had I spent in caves, how many a time had I even thought of giving up this body since liberation was not achieved, what strenuous efforts had I made for my spiritual practices! But now I have not that thirst for liberation. My present mood is that so long as even one individual lives in this world without gaining liberation, I do not want my own liberation." Hearing these words of Swamiji I began to wonder at his infinite kindness of heart, and I thought within myself, "Does he convey to us the nature of the avatara by quoting himself as an example? Is he also then a divine incarnation?" And I thought. "Maybe, he no longer aspired after liberation, because he had already attained it." On another day myself and Khagen (Swami Vimalananda) went to him after dusk. In order that we might be specially introduced to Swamiji, Haramohan Babu (a devotee of Shri Ramakrishna) spoke to him, "Swamiji, these are your great admirers and they study Vedanta with great aptitude." Though the first portion of Haramohan Babu's words were literally true, the second part was overdone. For although we had studied something of the Gita and a few primers on Vedanta, we could be credited with no more than a superficial knowledge; we had not studied them with the thoroughness of a student nor had we recourse to the original texts and commentaries on the same. Whatever that might be, hearing Vedanta mentioned, Swamiji asked us. "Have you studied the Upanishads?" I replied, "Yes, a little." Searching my mind and finding nothing else I replied, "Katha Upanishad." Swamiji: "Well, repeat a few lines. Katha Upanishad is very grand, full of poetic beauties." What a catastrophe! Perhaps Swamiji understood that I knew Katha Upanishad by heart, and I was asked to repeat a few verses from it. Though I had turned over the pages of this Upanishad, I had cared neither to grasp its meaning nor commit it to memory. So I was in a sad predicament. What should be done! Suddenly I struck upon a plan. A few years back I had made some regular attempts in reading the Gita and as a result I could remember most of the verses. I knew for certain that if I did not repeat from memory some scriptural texts at least, I could hardly show my face before him afterwards. Therefore I said; "I do not know by heart Katha Upanishad; but from the Gita I can repeat a few verses." Swamiji ordered me to repeat a few verses from the Gita. From the latter part of the eleventh chapter I repeated all the verses which Arjuna sang in praise of the Lord. To inspire us with enthusiasm, Swamiji was punctuating my recitation with his appreciative remarks. The next day, taking with us our friend Rajendranath, we went to see Swamiji. I told Rajen: "Brother, yesterday I was thrown in a very delicate position before Swamiji with my poor knowledge of the Upanishads. If you have with you any Upanishad, take one with you in your pocket so that if any occasion arises, we can draw it out from our pocket and read out before Swamiji." Rajen had a pocket edition of the Upanishads by Prasanna Kumar Shastri with a commentary in Bengali. We took this in our pocket. That evening we found Swamiji's room filled with visitors. What I had thought of came to pass. Somehow or other the topic of conversation turned to Katha Upanishad. Immediately taking out the book from my pocket I began to read the Upanishad from the beginning. And as I read, Swamiji spoke of the faith of Nachiketa, that faith whereby he dared even to go to the house of Yama (Death). When I began to read of the second boon of Nachiketa regarding the attainment of heaven, Swamiji asked me to read a few verses here and there and begin that part dealing with the third boon; Nachiketa asks Yama about the doubts of men, whether man ever survives bodily death. And Yama places temptations before him, but he rejects them all. After reading of these was over Swamiji spoke in praise of his character, in words pregnant with celestial fire. But my weak memory retains but little of that day's talk. It was the end of April 1897. Only five days ago I had left home to live with the sannyasins of the Alambazar Math. Swamis Premananda, Nirmalananda, and Subodhananda were then living there. Swamiji presently came back after his visit to Darjeeling. Along with him there were Swami Brahmananda, Swami Yogananda. and his Madrasi disciples, Alasinga, Kidi, G. G., and others. Swami Nityananda, only a few days before, took sannyasa from Swamiji. He spoke to Swamiji one day about the need for a systematic training for the Math, as a large number of young men had at that time joined the Math to lead a life of renunciation. Swamiji readily agreed to the suggestion and asked him to gather all the inmates who all assembled in the hall. "Let some one be writing as I dictate," said Swamiji. No one seemed to be prepared to come forward, and finally the task fell on me. It might be said in passing that at that time, with the inmates of the Math, literary education was out of favour, the prevailing notion being that to realize God by sadhana and bhajana was the goal, while literary knowledge even though it might bring a little fame and name was really useless for a sadhaka (aspirant). Only in the case of those who are chosen by God to carry His mission or message was the need for literary training recognized. When I came forward to take down Swamiji's dictation, Swamiji casually remarked whether I would stick on, and some one answered that I would. All the while I was getting the writing materials ready; and Swamiji before dictating the rules remarked as follows: "Look here, we are going to make rules, no doubt; but we must remember the main object thereof. Our main object is to transcend all rules and regulations. We have naturally some bad tendencies which are to be changed by observing good rules and regulations; and finally we have to go beyond all these even, just as we remove one thorn by another and throw both of them away." The course of discipline and routine decided upon was of this kind: Both mornings and evenings should be devoted to meditation, while the afternoons after a short rest should be utilized for individual studies, and in the evenings one particular religious book should be read and expounded. It was also provided that each member would take physical exercise both morning and evening. Another rule was to the effect that no intoxicant save tobacco should be allowed. Having dictated the rules, Swamiji asked me to make a fair copy of the rules and instructed me that I should put all the rules in the positive form. Another day Swamiji was sitting in the hall, his face radiating an unusual brilliance. A variety of topics were talked about. Amidst the audience was our friend Vijaya Krishna Bose. In those days Vijaya Babu used to ascend many a platform and speak before many associations. He had once even spoken before the Congress in English. Somebody let Swamiji know of his capacity to deliver lectures, and so Swamiji asked Vijaya Babu to deliver a lecture as there was quite a good audience. The subject suggested was atman (Self). But Vijaya Babu exhibited no signs of willingness to act up to Swamiji's suggestion; and Swamiji and all the rest tried in vain to set him upon his legs. After nearly fifteen minutes of ineffectual persuasion their glance fell upon me. Before coming to the Math I had occasionally delivered a few lectures in Bengali, and in our Debating Society I trained myself to speak in English as well. Some one present referred to this, and I was caught hold of to speak on the same subject. I have never been encumbered much with that inconvenient commodity called modesty. I at once stood up and held forth for nearly half an hour giving out ideas about atman beginning with those contained in the Yajnavalkya-Maitreyi samvada (conversation between Yajnavalkya and Maitreyi) of the Brihadaranyaka Upanishad. I did not pay any heed whether there were grammatical mistakes or any incongruity of ideas in my speech. Our gracious Swamiji also, without caring for any of these, began to cheer me enthusiastically. After me, Swami Prakashananda (who is now in charge of the Hindu Temple, San Francisco, U.S.A.), a new initiate to sannyasa, also spoke for about ten minutes on atman. He modelled his speech on that of Swamiji and in good sonorous voice spoke out what he had to say. Swamiji extolled much his speech also. At that time in the Math we received from Mr. E.T. Sturdy of London the copies of Swamiji's jnana-yoga lectures printed in pamphlet form. Swamiji had not then returned from Darjeeling. We were reading with great enthusiasm those soul-entrancing and inspiring interpretations of the Advaita Vedanta contained in those lectures. The old Swami Advaitananda did not know English well. But it was his special desire to hear how "Naren" captivated the heart of the West, what interpretation of the Vedanta brought out their admiration of him. By his request we used to read and explain the substance of those lectures before him. One day Swami Premananda asked the new bramhacharins to translate Swamiji's lectures into Bengali. So we began to do it. Meanwhile Swamiji returned to the Math, and Swami Premananda spoke of this to Swamiji and asked me to read out the translation before Swamiji. Swamiji also, while expressing his opinion on the translation, remarked that certain words would sound better if put in a particular way and so on. One day I was alone in the presence of Swamiji. Suddenly he spoke to me "Why not you translate my Raja-Yoga?" I wondered why Swamiji ordered such an unfit person like me to do this work. Long ago I had tried to practise raja-yoga. For some time I had such an attraction for this yoga that I even used to look down upon the other paths of jnana, karma and bhakti. I was under the impression that the sadhus (holy men) of the Math knew nothing of yogic practices, and hence they did not encourage them. My reading of the Raja-Yoga revealed to me that Swamiji had not only a thorough grasp of the truths of raja-yoga — for therein I found a masterly exposition of all ideas I had already gathered on the subject — but had also brought out in a beautiful manner their true relations with other yogas as well. Another reason which increased my faith and devotion was this. Was it that in asking me to translate the Raja-Yoga Swamiji meant to help me in my spiritual growth by bringing about thereby my close consideration of the truths of this yoga? Or was it because the raja-yoga practices are not much current in Bengal that he desired that the truth should be sown broadcast there? In a letter to Babu Pramadadas Mitra he writes that the practice of raja-yoga is completely ignored in Bengal and what little there is of it is only such as blowing through the nose and the like. Whatever that might be, without caring for my own shortcomings, I immediately set at work to carry out Swamiji's order.